Source: Clean Tech Company Extreme Energy Solutions says after successful third party laboratory testing and intense field testing around the world with positive results, the Smart Emissions Reducer is now ready for mass market adoption. In the last five years, the Smart Emissions Reducer, under the stewardship of Extreme Energy Solutions had been introduced domestically while also making landfall in Canada, Saudi Arabia, Jordan, China, and Italy. It is there, where a number of these devices have been tested, sold, and considered by government, commercial fleet operators, as well as engine and vehicle manufacturers, in their quest to play their part in lowering harmful toxic vehicle emissions while maximizing the efficiency of their vehicles. The Smart Emissions Reducer has been put through a battery of testing in the last half a decade which included a regiment of testing by Roush Industries, in Lavonia, Michigan. The purposes of these tests were to baseline a vehicle’s emissions and fuel economy numbers without the device applied to the vehicle, then again to trial the vehicle with the device under controlled laboratory conditions. Two sets of vehicles in 2012, 2015, 2016 were sent to the laboratory, all demonstrating consistent results, which showed the device had a positive effect on lowering the vehicles emissions? even up to a 65% reduction in emissions. Fuel efficiency numbers were also compared, with testing revealing up to a 7.5% increase in fuel efficiency on specific year and make models. The Changzhou Keshi Group tested the Smart Emissions Reducer in their lab, located in Jiangsu Providence of China. Extensive testing protocols were practiced in testing the device. Keshi tested the device on Cummings diesel engines that were modified for use by the vehicle manufacturer that specializes in mining equipment and vehicles. Their results demonstrated the Smart Emissions Reducer performed well, with up to 25% reduction in certain emissions and up to 2.5% increase in fuel efficiency. In addition to Roush and Keshi, the Smart Emissions Reducer was tested by FreeCol Labs, via a mass spectrometer test. This particular test verifies the before and after effects of the pollutants and chemical makeup of emissions gases as they entered and exited the device. The tests were very revealing in providing information that the Smart Emissions Reducer has an effect on blowby exhaust gases. The Smart Emissions Reducer has seen a number of realtime pilot program trials and testing in the field. Devices were installed on a number of vehicles, and monitored over a period of 30-60-90 day intervals. Emissions results were recorded as business and municipal fleets would provide the very first series of field trials of the device. The first municipal fleet trial was ran in Andover Township, New Jersey. The next municipality to try the Smart Emissions Reducer was Winnebago County in Illinois, followed by the City of Rockford (IL), Douglas County (OR), and the Philadelphia Parking Authority (PA). These vehicle fleets saw results between a 25% to 75% reduction in emissions as well as fuel efficiency gains? in some cases, up to 12% and 15%. Some of these municipalities opted to purchase the devices used during the pilot program and thereafter. Commercial business fleets to pilot the device, some implemented a plan to retrofit select vehicles throughout their northeast locations. The New York City Taxi and Limo Commission reviewed the device as well, and made it permissible for vehicles under their rulemaking to be retrofitted with the green technology device. Taxi fleets in California also tested the device with much success. The device was also tested on the 602 GM Crate Engine, commonly founded throughout the Northeast dirt track racing circuit. 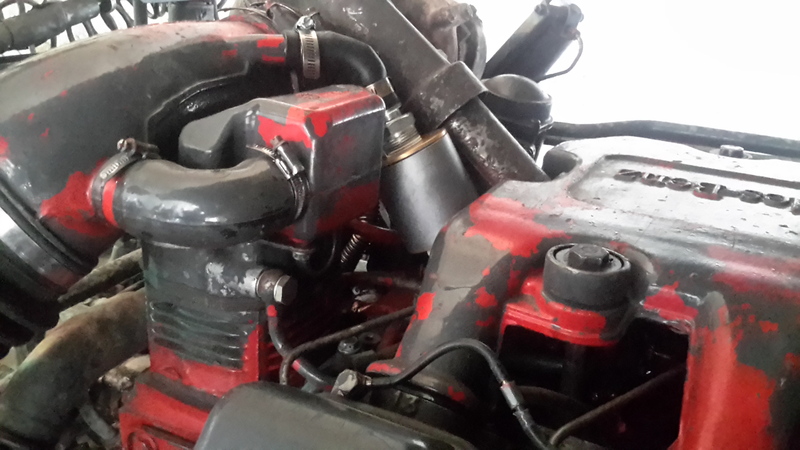 Crate Motor Connection had provided the dyno and tested the engine retrofitted with the device, reporting back that they monitored no adverse findings and with a slight increase in efficiency noticed. With these successes on the books, Extreme Energy Solutions decided it was changing its business model, making the device available to vehicle manufacturers. The choice came in 2014/2015 when the final test results were collected from pilot programs in Jordan that solidified the verdict of the Smart Emissions Reducer’s worthiness. Since then, Extreme Energy Solutions has visited with a number of potential clients/vehicle manufactures headquartered in the United States as well as various other countries including China and Italy. The company has a number of LOI’s from vehicle/engine manufactures where talks are still ongoing. Burlum was noted in saying that Extreme Energy Solutions would still entertain a local/regional Smart Emissions Reducer pilot project with a municipality or commercial fleet if the terms and conditions were not in conflict with the company’s current direction. The Company has projects slated in Jordan and South Africa to continue testing the Smart Emissions Reducer in the field on both commercial and government owned vehicles. Source: World Green Energy Symposium puts the world on notice to focus soil and water conservation and preservation in the hopes that society will adopt best practices when it comes to healthier food production and cleaner energy. 2016 World Green Energy Symposium, this year held in Washington DC, at University of District of Columbia, at the University’s new energy efficient, award winning LEED facility, April 7, 2016. The WGES put back the focus on the core essence of life, the very building block to all of our existence, water; which affects everything else as humans we do. Once discussions about best practices on how to clean up our fresh water supply were revealed, the conversations turned to our need to focus on clean air, soil, food, and clean-green energy. Four-time Emmy Winner, former Broadcast Journalist Jan Fox was the event’s emcee and opened the event at 9:30 am introducing special guest and speakers to the podium. Mr. Tommy Wells, Director of Energy and Environment, with the District of Columbia had first reported to the audience of attendees his findings and experiences at global meetings focused on climate change. Including in his address were factors and trends taking place in developed nations. “In Europe, there are major metro cities now making policies to cut out the need of any fossil fuel sources, which is forcing the auto industry to change their products to meet these new standards,” shared Wells. Dr. Sebine O’Hare, Dean of College of Agriculture, Urban Sustainability & Environmental Sciences (CAUSE), University of DC, provided insight to sustainable food production and the need for micro food management. Dr. Sebine O’Hare and CAUSE were formally recognized in 2015 by the WGES as a NOVA Award recipient for their advancements in this field. Ms. JoAnn Hill, and Ron Uba, both with the US Department of Commerce, throughout the day would present economic opportunities for entrepreneurs in the room seeking ways to grow their business in partnering with government to solve environmental issues and concerns. Together their department has been credited in providing millions of dollars in contract opportunities to small business. The importance of clean air, soil and water conservation and better food growth methods was furthered by R. Sonny Ramaswamy, Director with the National Institute of Food and Agriculture, USDA, where he disclosed examples of working projects aimed at lessening our carbon footprint while meeting the needs of a growing population. Mr. Michael Jones Bae, spoke about the future and how to harness future opportunities within the green tech, environmental, and energy industry sectors as he gave many words of inspiration for students and entrepreneurs attending the conference. “Look to the future and do not focus on profits, focus on solving problems, and the opportunities to make a profit will reveal themselves,” Bae added. Attendees also got a fresh perspective on how the US GSA is handling policy, budgets, and practices to green government building and how to maximize their use, presented by Mr. Kevin Kampschroer, Chief Sustainability Officer for US GSA. His expert panel walked attendees through one of the most extensive undertakings; to convert of one of the oldest GSA buildings in the country, into one of the most modern and energy efficient within its building class without compromising the buildings historical significance. Panelist dedicated time to explain the challenges of such and endeavor and how they overcame challenges to make this building a model for other to follow. Mr. Paul Puckorius, wrapped up the day’s series of events with commentary directed toward water and waste management; where he lent his experience and expertise on ways we all can help in conserving water, and the importance to be mindful of this value resource. Professor Gallagher recognized all of the past World Green Energy Symposium NOVA Award Honorees for their contributions to advancements in solving problems associated with environmental and energy issues, as he prepared to recognize the 2016 NOVA Award Class of Honorees. The 2016 Class of Honorees included Ron Uba for his multiple years of dedication and commitment to environmental sustainability and for his ability to align entrepreneurs with public policy, thus spurring off millions of dollars in economic growth. The US GSA also received the honor for its innovation in testing and implementing new green technology, in what is now one of the most energy efficient government buildings in the entire country. The hosting site for the event, the University of District of Columbia was presented with an award for their continued efforts for urban planning that pushes for maximizing and recycling value resources such as water, air, food, and energy. “This year’s World Green Energy Symposium seemed to focus on the basics, the fundamentals of what fuels our very existence,” contributed Samuel K. Burlum, CEO and President, Extreme Energy Solutions, a green tech company located in Ogdensburg New Jersey, and scheduled presenter at the conference. “Since all of these elements influence technology, entrepreneurs needs to look to creating the next generation of innovation and products surround these key areas in order to be ahead of the curve,” mentioned Burlum. Source: H2O Energy Flow LLC, from Cedarburg, Wisconsin pars up with Extreme Energy Solutions, Ogdensburg, NJ, to make available H20 Energy Flow Bottled Water to regional markets and retailers. Recently H2O Energy Flow LLC, of Cedarburg, Wisconsin teamed up with Extreme Energy Solutions Inc., of Ogdensburg, New Jersey and with ESLC Inc. of Hewitt, New Jersey to help launch the H2O Energy Flow product line in the northeast region; making the product available for both direct to consumer and through selected retailers. H2O Energy Flow is structured water, designed to offer a balanced pH level of 7.8, and is offered in a 16.9 fluid ounce bottle. The water is bottled using a proprietary technology that aids in structuring the water so when it is bottled, it remains “live” water. H2O includes the essential of minerals of calcium and magnesium, when it is bottled at the source in north central Wisconsin. Unlike other bottled water which may be bottled from a public source, such as a public well or from municipal water reservoirs, that sometimes may contain fluoride or chlorine; H2O Energy Flow does not contain any arsenic, chorine, chromium 6, or trace pharmaceuticals, which sometimes are found in water that is bottled and sourced from recycled water treatment centers. H2O also does not contain any bisohenol A (BPA’s), or methyl tert-butyl ether (MTBE’s), which can be found in some bottled waters. BPA’s and MTBE’s have been known to be used in the making of plastics, including plastic bottles in which bottled water is packaged. Many water companies have banned the use of these types of bottles. Extreme Energy Solutions was commissioned as a beta distributor at first, whereas Extreme would test different business models on how to bring the H2O product to market. Extreme was able to test the market as it offered H2O direct to consumers in an early consumer market study and through a select few local retailers. The results have been positive. “I once thought water was water, but that all changed the second I tried H2O Energy Flow. It’s the purest, freshest tasting water I have ever had and I can truly feel the difference. I look forward to opening each and every bottle,” contributed Dennis Kotnour, from Wisconsin. Extreme Energy Solutions offers a special promotion; first 100 people who visit http://extremeenergysolutions.net/get-a-free-quote.html and send the promotional code in the message area “H2O Today” will receive a free sample of the product by the company. Participants are required to provide a mailing address in order to receive their free sample. Mark Bublitz, a Therapeutic Nutritional Counselor and Founder of H2O Energy Flow LLC, hails from the Metro Milwaukee, Wisconsin area. He founded H2O Energy Flow in 2013 after becoming inspired by the book, The Hidden Messages of Water, by Masaru Emoto. Extreme Energy Solutions is currently a distributor of H2O Energy Flow in the northeast. Sam Burlum has lent his expertise to H2O in helping the company to be positioned to offer its product beyond the borders of Wisconsin. “We enjoy working with Mark Bublitz and H2O Energy Flow. Our clients have provided us positive feedback about the product as they beta tested and sampled it. Our retailer partners have also welcomed the product with open arms. We look forward in seeing the product on the shelves of selected retailer partners in the near future,” added Samuel K. Burlum, CEO and President of Extreme Energy Solutions Inc., Ogdensburg, New Jersey. Burlum also operates a small business consulting firm, located in Hewitt, New Jersey. “One of the most important basic building blocks to life is clean and healthy water. Mr. Bublitz has a sheer passion for this industry and we wish him and H2O Energy Flow much success,” continued Burlum. Source: Elly McGuire, author of “Schmitty the Weather Dog: Daydream,” Meteorologist Ron Trotta, and Schmitty the Weather Dog team up with Extreme Energy Solutions and Extreme Kleaner in promoting environmentally green living in the classrooms of elementary school children. Elly McGuire, author of “Schmitty The Weather Dog: Daydream,” Meteorologist Ron Trotta, and Schmitty The Weather Dog, have teamed up with the up and coming green tech company, Extreme Energy Solutions, Inc., located in Ogdensburg, New Jersey, to help promote healthier and more environmentally friendly choices in the hopes of bringing green technology awareness to the classrooms of children. Together Extreme and the Schmitty the Weather Dog Team will begin their journey in encouraging both school administrators and children to consider more sustainable green products that end up in use in the classroom. The first stop on their list is the National Association of Elementary School Principles (NAESP) convention in Long Beach California, June 30 through July 2, 2015. At the conference, Schmitty the Weather Dog and Meteorologist Ron Trotta will be the official weather team and headline entertainment where thousands are expected to attend. Extreme Energy Solutions product, Extreme Kleaner, a non-toxic, biodegradable multi-purpose cleaner-degreaser, is their sponsor. When asked about what she thought about Extreme Kleaner, Schmitty the Weather Dog responded by giving it a four paws up. Schmitty the Weather Dog, accompanied by McGuire and Trotta, have been at the center of over 60 elementary school assemblies this year, promoting STEM, the study of science, technology, engineering and math, through the use of their entertaining literacy and music program. Team Schmitty The Weather Dog has been coast to coast, bringing their program to schools throughout New York City, Los Angeles, Connecticut, Rhode Island, Massachusetts, Pennsylvania, and New Jersey. At the end of each assembly, author Elly teaches about respect for animals and gives each student the opportunity to meet Schmitty The Weather Dog. Through corporate and private sponsors, student usually walk away with their very own copy of the “Schmitty the Weather Dog: Daydream” book. “Science and math are at the core of green technologies, and we feel it is important to help foster younger generation’s educational experience with information that will not only get them excited about preserving the environment, but also excited about the opportunities and possible career choices that may be available to them in the future,” contributed Samuel K. Burlum, CEO and President of Extreme Energy Solutions, Inc.
Meteorologist Ron Trotta, who has the distinction of being a three time World Champion Ragtime Pianist, has worked for ABC World News, and since then has partnered with Schmitty the Weather Dog and author Elly McGuire to inspire and excite children across America to study STEM subjects. Schmitty has also shared the stage in New York’s Central Park with Oprah and will be the “cover dog” on this summer’s issue of Hamptons Pet magazine. When Schmitty is not giving a “pawcast” posted on the Schmitty the Weather Dog You Tube Channel, you can find her visiting schools locally and nationally bringing the message of the great opportunities that STEM subjects have to offer. Source: Extreme Energy Solutions has partnered with local stock car driver, Ron Constable, and the #49 Team Froggy Street Stock Racing Team to assists in the promotion of the non-toxic biodegradable cleaner-degreaser known as Extreme Kleaner, in an effort to create awareness of green product solutions to both the racing community and local markets. Extreme Energy Solutions, Inc. and Extreme Kleaner announced their sponsorship of the local stock car owner/driver Ron Constable and the #49 Team Froggy, a local stock car racing team from Lafayette, New Jersey. Team Froggy will be displaying the logo and colors of Extreme Kleaner for the 2015 racing season. Currently Team Froggy competes at the Orange County Fair Speedway, located in Middletown, New York. Ron Constable, who hails from Lafayette, New Jersey, has been involved in stock car racing since 2003. The 34 year old is a graduate of Sussex County Vo-Tech High School, and works in the field of heating and air conditioning when he is not focused on his racing campaign. “I have personally used the product for cleaning up the race car and our tools, and I have to say that Extreme Kleaner is a great product. Before accepting the sponsorship deal, I wanted to make sure the product really worked. To my surprise it is the best product I have used in cleaning the dirt and grime after a night of racing at the dirt track,” Constable contributed. Currently Extreme Kleaner is available on the shelves of selected Ace Hardware and True Value Hardware Stores, coast to coast. More hardware stores are adding Extreme Kleaner to their product mix every week. The #49 Extreme Kleaner sponsored Team Froggy race car has been seen on display at a number of these stores including at the True Value of Milford and Dingmans Ferry, Pennsylvania and at the Ace Hardware in Caldwell, New Jersey. Future promotional events over the next few months include additional displays at Ace Hardware and True Value Hardware stores throughout New Jersey and New York in the months of July and August. “The people at Extreme Kleaner are good people who care about the community and the environment. I am glad that I can help bring green products to the racing community and beyond,” continued Constable. Extreme Kleaner is a non-toxic biodegradable multi-purpose cleaner-degreaser safe for the majority of surfaces. The product has been certified by the National Sanitation Federation, and the product and company was recently recognized by the Passaic Valley Fraternal Order of Police Lodge #181, naming Extreme Energy Solutions, Inc. 2015 Company of the Year in the Professional area of Environmentally Friendly Energy Products. “With the success of this campaign, we have other racers and retailers interested in Extreme Kleaner, and will entertain the idea of expanding our motorsports marketing efforts into the 2016 racing season,” Burlum remarked. Extreme Energy Solutions Inc. and Constable/Team Froggy are in discussions and negotiations to extend their agreement into next season and beyond. His Excellency, Minster of Environment, Dr. Taher Shakhshir meets w/Samuel K. Burlum, CEO of Extreme Energy Solutions, Inc., and Kabeer Minhas, of Global Tap -Consultant to Extreme Energy Solutions. The Ministry of Environment is Jordan’s equivelant to US EPA. SOURCE: NASCO and FANNOUN partner with Extreme Energy Solutions in giving the Smart Emissions Reducer a trial run in lowering vehicle emissions while looking to increase gas mileage in Jordan. Two industry leaders in Jordan tests Smart Emissions Reducer Technology offered by Extreme Energy Solutions. NASCO and Fannoun begin field testing of the device on buses and trucks. It’s the technology which is making an impact on vehicle emissions reduction on the worldwide stage, now gets a chance to demonstrate its ability to lower harmful emissions while increasing fuel mileage in Jordan. Over two dozen vehicles, including buses, trucks, taxi cabs, and personal vehicles are the first to recieve the Smart Emissions Reducer under the hood in the City of Amman. Nicola Abu Khader, CEO of the Abu Khader Group, the parent company of NASCO, the region’s largest auto parts supplier, and operator of car dealerships that offer Cadillac, Chevrolet, GMC, Mitsubishi, and Opal vehicles, and are private partners in the local bus transit system, City Municipal Transit; partners in testing the new green technology for reducing emission, offered by an emerging technology company from New Jersey. 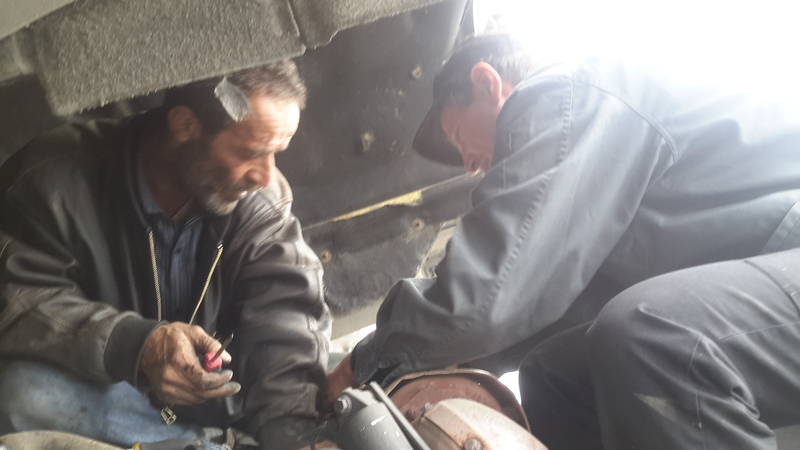 Fuel Economy Expert Mike Holler instructs and assists Fannoun’s Technican, Mr. Zeppe on the proper way to Install a Smart Emissions Reducer on a Mercedes Actros diesel powered engine. “We are looking forward to testing the Smart Emissions Reducer on our trucks and cars Jordan. If the device demonstrates that it works as it has in the past in other places around the world, it will be a very good thing to have in Jordan,” added Nicola Abu Khader, CEO of the Abu Khader Group, parent company of NASCO. “Fuel is one of our biggest costs in our business and we are excited to test this device. As our population continues to grow, pollution continues to increase. So fuel efficiency while being able to reduce our carbon emissions will be huge plus to our business and community. It is critical to prove the cost savings of this device. Helping the environment is always important, and we open to exploring affordable ways to do this,” added Abu Khader. Smart Emissions Reducer installed in Actros Big Rig diesel powered engine. 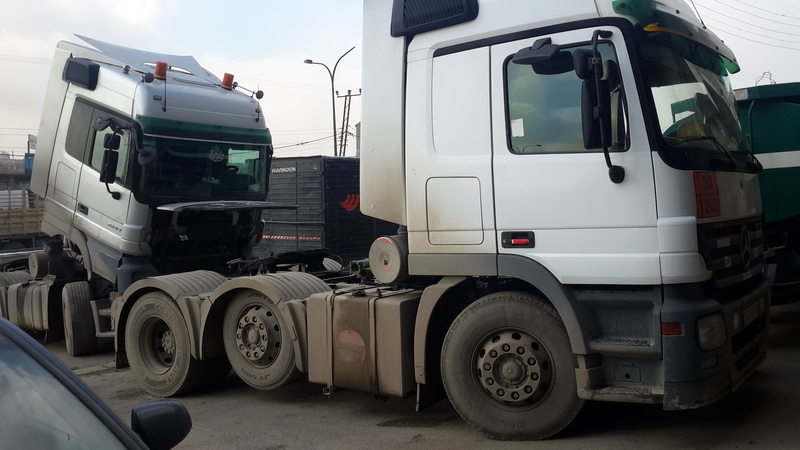 Yasser Fannoun, General Manager of Fannoun Tires, also has partnered with Extreme Energy Solutions, in testing the Smart Emissions Reducer, in Jordan, to help lower fuel consumption and address the concerns about rising pollution problems in the City of Amman. Fannoun also operates Fannoun for Trade and Transport, a trucking and logistics company, which is the test bed for proving the Smart Emissions Reducer’s ability to help lower emissions. Trucks line up at Fannoun Tire to be retrofitted with the Smart Emissions Reducer. here to Jordan,” continued Fannoun. Currently, vehicle owners expect to pay over $0.92 JD for a liter of gas (equals $ 3.48 per gallon in US Dollars) and $0.97 JD for a liter of diesel fuel in Jordan (equals to $3.67 per gallon). Over ten transport trucks for Fannoun were retrofitted with the Smart Emissions Reducer by Extreme Energy Solutions, and will be monitored over the next 90 days. Extreme Energy Solutions will return to Jordan each month to assist in testing the emissions of each vehicle. In addition to ten over the road transport trucks, four yellow taxi cabs were also retrofitted with the Smart Emissions Reducer device. These vehicles are under the supervision of Fannoun during the test period. The City of Amman is experiencing immense growth in its population, and with the boom brings the need for people to travel, adding more vehicles to the road. The demand for vehicles in Jordan is at its highest. With more vehicles on the road, brings the concern of increasing pollution from more vehicle traffic. Mike Holler inspects a Smart Emissions Reducer installation and explains its functionality to NASCO’s Engineer Mr. Mohammed Abdo, head of Business Development and Marketing Manager for Spare Parts Division. Joining them is Kabeer Minhas, Consultant to Extreme Energy Solutions. “We look forward to a long term relationship. Meeting with Officials of the Jordanian Government, we have discovered they are very serious about meeting environmental initiatives in preserving the air quality of Jordan, while lessening their need for energy,” Burlum continued. Extreme Energy Solutions met with His Excellency, Minster of Environment, Dr. Taher Shakhshir; Her Excellency, Lina Shbeeb, Minster of Transportation; and Husam Mamdoh Abd Al-Nejdawi, Executive Director of Fleet for the Greater Amman Municipality; all who expressed their interest in the Smart Emissions Reducer, and expressed the importance of fuel savings and in reducing pollution in Jordan. There is much potential and need for this technology in Jordan. Jordan is a member of the C40 Cities Climate Leadership Group, a network of the world’s megacities committed to addressing climate change. The majority of Jordan’s gasoline and diesel is imported from outside the country. Saving money on fuel is not only a matter of interest in the commercial market, but of interest by public entities. 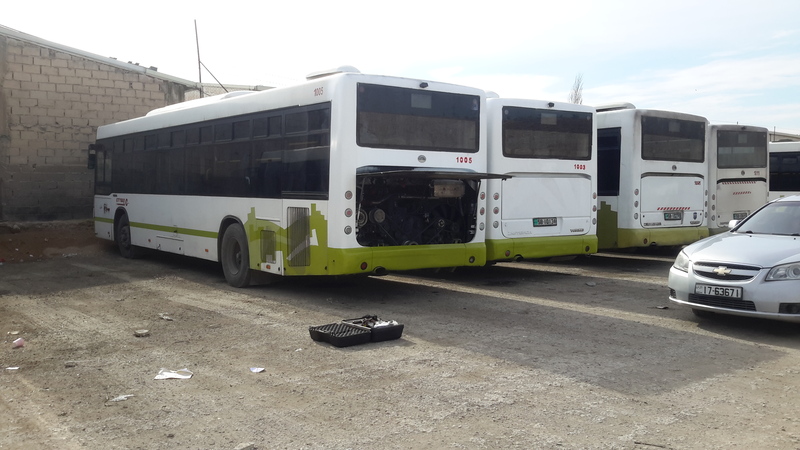 Jordan City Buses begin to get prepped for Smart Emissions Reducer units, as before installation emissions testing is conducted to baseline the vehicles. equipment in China, whereas it was discovered Smart Emissions Reducer provides up to a 5% fuel economy savings while tested on 5.9 liter engines produced by Cummings; while lessening the impact of emissions by 65%. 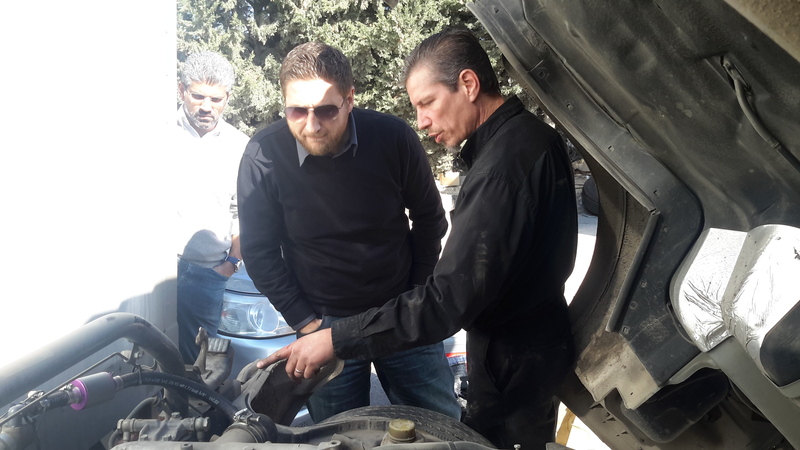 The Extreme Energy Solutions Team was led by Samuel Burlum, CEO and President of Extreme Energy Solutions and recognized Fuel Economy Expert Michael Holler, who spent the week in Jordan to launch the partnered testing program. Extreme Energy Solutions is headquartered in Ogdensburg, New Jersey, and is the provider of other technology that delivers on having a positive impact on the environment, in addition to Smart Emissions Reducer.